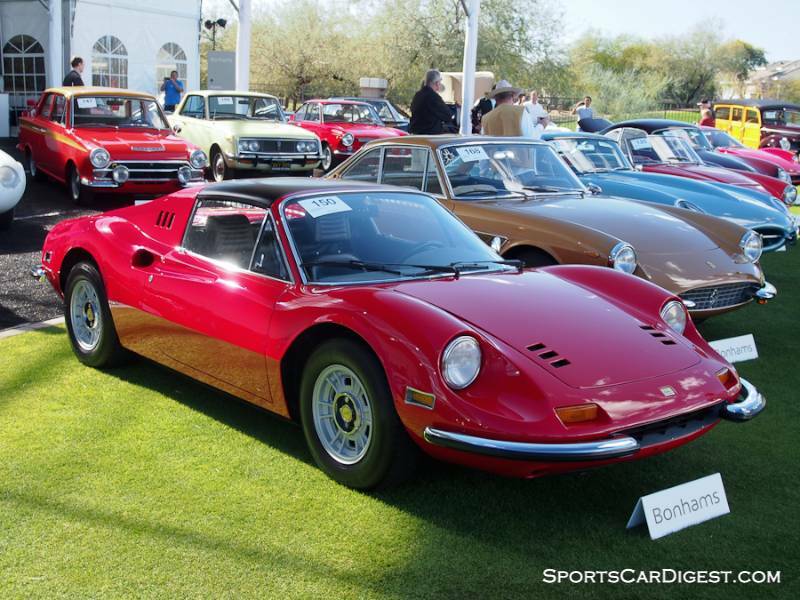 Auction Editor Rick Carey reported from dozens of auctions in 2015, starting with the Scottsdale and Kissimmee sales, moving quickly into the Amelia Island sales and continuing throughout the rest of the year. Ferraris — the unquestioned epicenter of the collector car market — were a huge focus of Carey’s reports, with no less than 178 of Maranello’s finest methodically examined in 2015. They ranged from modern variants you wouldn’t wish upon your worst enemy to the otherworldly 1956 Ferrari 290 MM. The biggest sale in dollars of 2015 occurred when RM Sotheby’s sold the 1956 Ferrari 290 MM (s/n 0626) for $28,050,000 at their New York City auction, besting the $18,500,000 Artcurial garnered for the ex-Baillon Collection 1961 Ferrari 250 GT SWB California Spider at their Retromobile event. Ferraris in 2015 were barely predictable. The allure of dirt, however, was consistently a factor, otherwise how did Artcurial sell Jacques Baillon’s 250 GT SWB California Spider (s/n 2935GT) in ratty, dirty, dented, dinged condition in Paris for $18.6 million at Retromobile in February and Gooding get $16.8 million for a similar covered headlight SWB Cal Spider (s/n 3095GT) at Pebble Beach. Dirt also powered two 250 GTEs to a near record prices, one (s/n 2919GT) starting off the year at Gooding’s Scottsdale auction where it brought $423,500 and another at Pebble Beach, the even dirtier s/n 2927GT, which sold for $418,000. But that paled beside the $797,500 that Gooding got for the beyond-perfectly restored s/n 2651GT at Pebble Beach. That’s over 3/4 of a million dollars … for a 250 GTE, a 2+2. Maybe all these buyers have young families and need the back seat for the toddlers? At the top of the Ferrari market occasional bursts of enthusiasm brought seriously eye-watering results, although none was more startling than RM Sotheby’s sale of Enzo s/n ZFFCZ56B000141920 from the Pinnacle Portfolio in Monterey for $6,050,000 (the $550,000 buyer’s commission was enough to buy one of those dirty, driven, dilapidated over-priced GTEs). Yes, it was the last Enzo built and, yes, had been given by Ferrari to Pope John Paul II. It was sold for what was then an extraordinary price of €1,055,000 ($1,282,987 at the time) at Sotheby’s auction at Maranello in 2005 with the proceeds to benefit victims of the SE Asia tsunami. Later brought into compliance with US (but not California) regulations. Two bidders fought from $3.7 million for the privilege of paying as much as humanely possible in a bidding contest more usually encountered when the proceeds go to charity. In this case they went to enhance Pinnacle’s ROI. 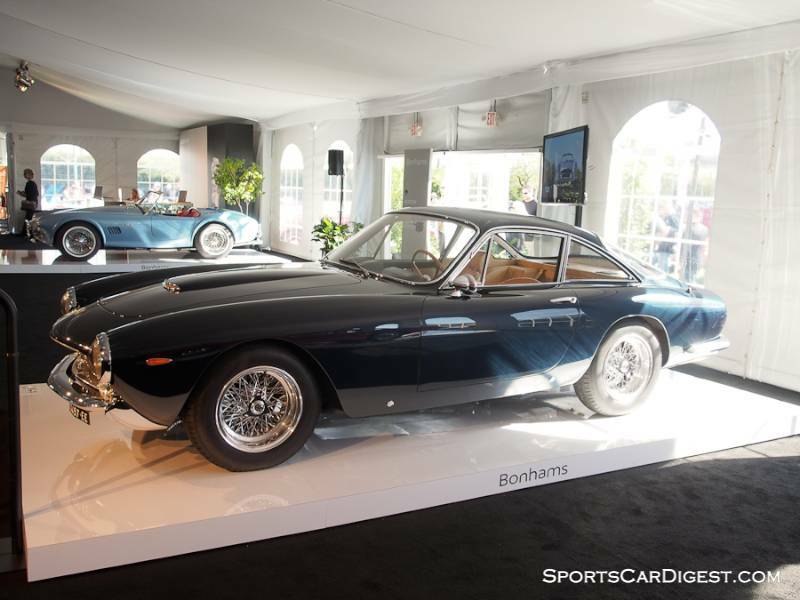 Six Ferraris sold on hammer bids of $10 million or more and they made up six of the top ten sales of the year. 51 of the top 100 transactions were Ferraris; the top 100 cutoff was $1,732,500 (a Porsche 959, not a Ferrari). 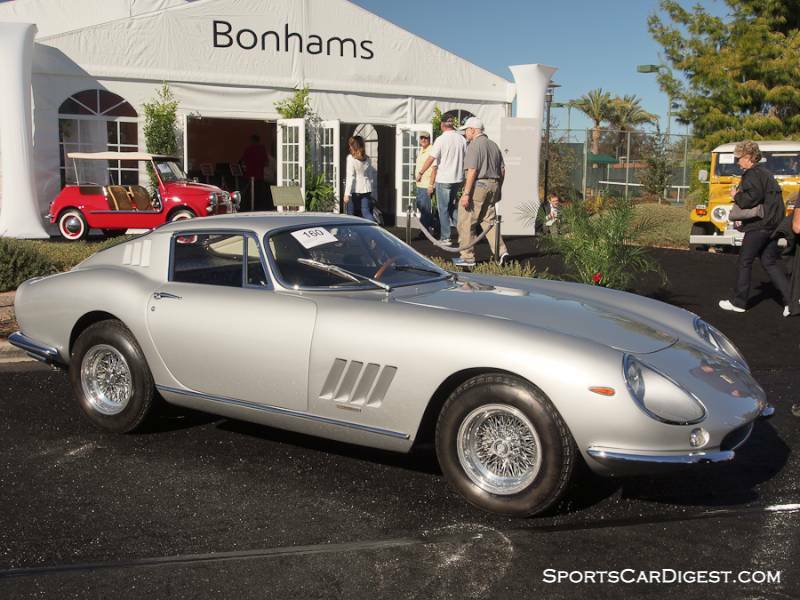 Speaking of bursts of enthusiasm it would be remiss not to mention the 6-speed 599 GTB sold by RM at Amelia for $682,000, two and one-half times its high estimate, double its original sticker price, and said to shift like a truck. 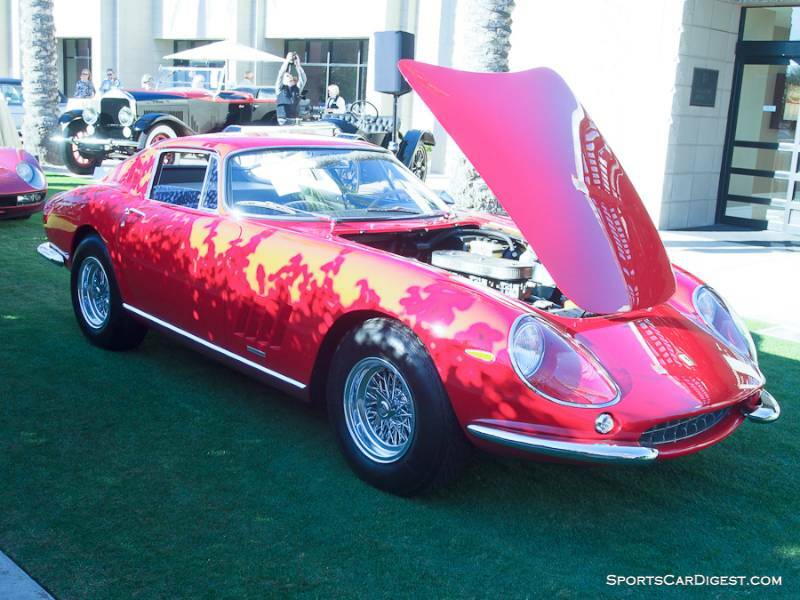 Lot # 116 1969 Ferrari 246 GT Dino Coupe, Body by Scaglietti; S/N 00542; Red/Black vinyl, Red terrycloth inserts; Estimate $450,000 – $500,000; Older restoration, 2 condition; Hammered Sold at $350,000 plus commission of 10.00%; Final Price $385,000. No Reserve – Centerlock Cromodora alloy wheels, Michelin XWX tires. – Early L-series 2.4 liter, restored in 2000. Excellent paint, interior, chrome and only slightly used terrycloth (not original, but a European option interior material.) Beautiful engine compartment. Done right but not done too much. FCA Platinum in 2000, 2002 FCA National Best V-6. Still in showroom condition. – About as attractive a Dino as could be hoped for, meticulously maintained since restoration. The red terrycloth seat inserts were a little jarring, but the consignor was right there to show that they were a European option (and great for trips back from the baths?) With Dino prices pushing into the $400Ks in Scottsdale this is the best Dino deal in Scottsdale. 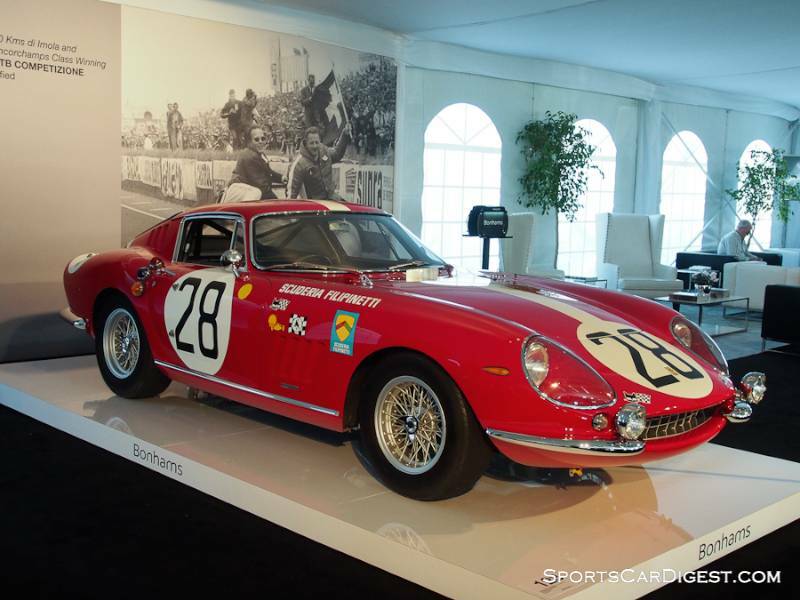 Lot # 128 1966 Ferrari 275 GTB Competizione Coupe, Body by Pininfarina; S/N 09079; Engine # 09079; Red, White stripe/Grey leather, cord cloth; Estimate -; Competition restoration, 2+ condition; Hammered Sold at $8,550,000 plus commission of 10.00%; Final Price $9,405,000 – RHD. Silver painted Borrani wire wheels, Avon tires, Marchal head and driving lights, FIA tagged rollbar, outside fuel filler, marker lights, fire system. – Ex-Scuderia Filipinetti, GT class winner at Le Mans in 1967, later raced by Jacques Rey with some success. Later burned in a garage fire and rebodied in aluminum by Brandoli during restoration. Restored again in 2006, 2nd in class at Pebble Beach. Ferrari Classiche Red Book certified. Restoration freshened in 2013 with period parts reinstalled to replace later historic competition modifications (which come with the car.) Excellent paint, interior and bright trim. Even gaps, flush fits. – Real race history makes a difference, but not enough to offset the new body. This is a lot Ferrari for the money, with performance that challenges GTOs and the option of continuing its as-built configuration or returning to historic competition. The price it brought makes sense on many levels. 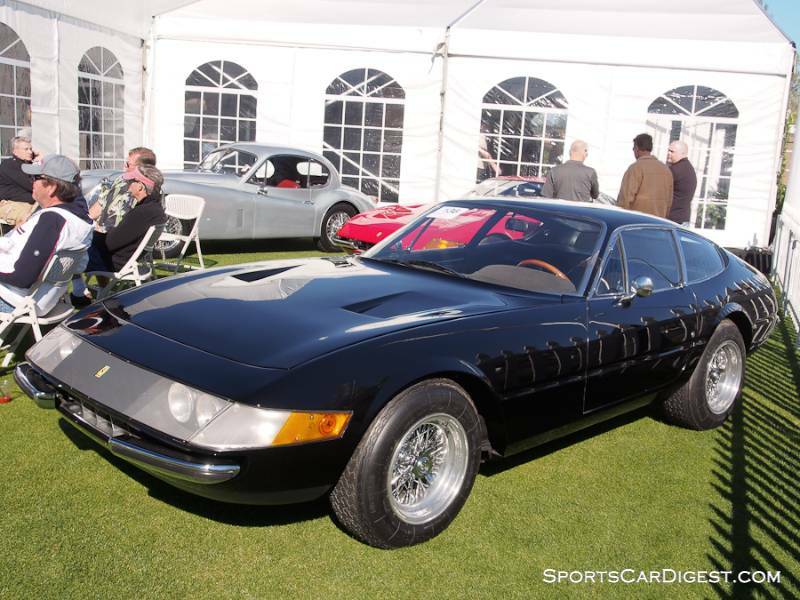 Lot # 136 1969 Ferrari 365 GTB/4 Daytona Coupe, Body by Scaglietti; S/N 12923; Black/Black leather; Estimate $650,000 – $800,000; Visually maintained, largely original, 3 condition; Hammered Sold at $680,000 plus commission of 10.00%; Final Price $748,000 – Chrome spoke Borrani wire wheels, Michelin XWX tires, A/C, painted nose panel, covered headlights, P/W. – Montreal Auto Show display car. Good cosmetics, comfortably worn in leather. Old undercoat resprayed over some peeling. Never restored but reassuringly presented. – Sold by RM in Monterey in 1998 for $91,592 in essentially the same condition it is in today and stated then to have DOT/EPA releases not apparent here. All the Daytonas in Scottsdale were in similar condition and this is the price champion, although not by enough to reach any definitive conclusions. Lot # 144 1963 Ferrari 250 GT/L Lusso Coupe, Body by Pininfarina/Scaglietti; S/N 4481; Engine # 4481 [1405/52E]; Blu Notte Metallizzato/Cream leather; Estimate -; Cosmetic restoration, 3+ condition; Not sold at Hammer bid of $1,925,000 – Chrome spoke Borranis, Pirelli Cinturato blackwall tires, Blaupunkt AM-FM, passenger seat headrest, tool roll, build sheet copies, owner’s manual. – Good older repaint, chrome and original interior. Underbody painted over old, peeling undercoat. Orderly engine compartment with some carb leakage. Cosmetically and mechanically renewed in 2007 with the original engine during 40+ years of ownership by Riley Kuehn, the immediately prior owner. A desirable example that has never needed restoration. – Offered at the Rick Cole ‘auction’ in Monterey last August where it no-saled on a reported bid of $2,201,000. The consignor seems fixated on the benign ownership and maintenance history, holding onto generous expectations that buyers have been unwilling to endorse. There was one other Lusso in the Scottsdale auctions, a more tired but also more original example that brought essentially the same money offered for s/n 4481. Lot # 150 1972 Ferrari 246 GTS Dino Spider, Body by Scaglietti; S/N 04870; Red, Black roof panel/Black vinyl; Estimate $350,000 – $450,000; Visually maintained, largely original, 3 condition; Post-block sale at $281,818 plus commission of 10.00%; Final Price $310,000 – Momo steering wheel, cassette stereo, A/C, Cromodora alloy wheels, Vredestein blackwall tires, P/W. – Fair repaint done over old cracks and erratically masked. Good upholstery and carpet. Badly water stained brown mouse fur dash top. Scratched side window glass. Orderly engine compartment. This Dino falls into the used car category, a description that’s not necessarily bad, but not a ringing endorsement, either. – Sold by Kruse at Auburn Fall in 1998 for $53,600, offered there in 2003 with a reported high bid of $52,500, then reportedly sold at Russo and Steele in Monterey in 2013 for $247,500, all apparently in about the same condition as presented here. It showed a claimed original 47,397 miles in 1998. The odometer showed 47,816 in 2003 and 48,609 miles today. The seller was realistic to take the money offered in this post-block transaction. 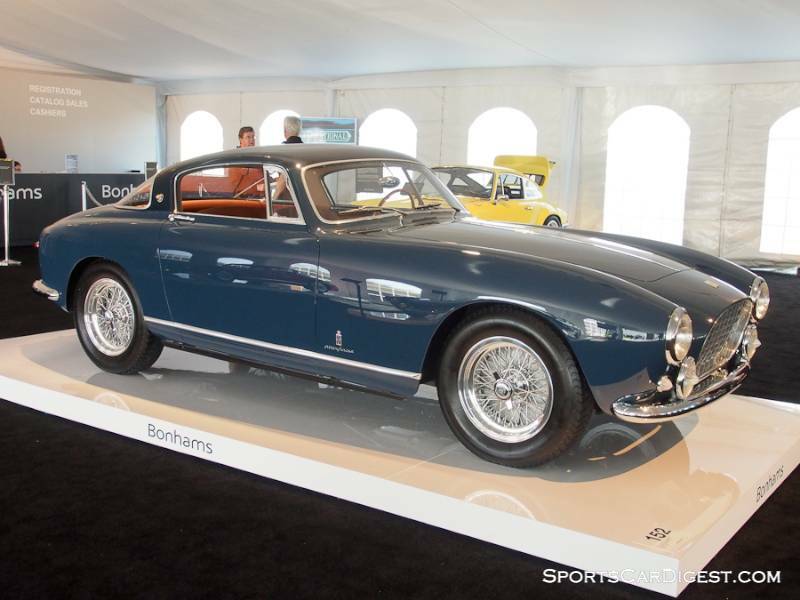 Lot # 152 1955 Ferrari 250 GT Europa Alloy Coupe, Body by Pinin Farina; S/N 0389GT; Engine # 0389GT; Blu Fiat 8V/Plastico Naturale leather; Estimate $2,800,000 – $3,400,000; Recent restoration, 2+ condition; Not sold at Hammer bid of $2,750,000 – Chrome spoke Borrani wire wheels, period-style Michelin tires, Marchal head and fog lights. – Represented as matching numbers engine, body and chassis, replacement gearbox. Competition specification chassis and brakes. Excellent paint, chrome and interior. Some dull side window trim with visible repairs. Spotless engine and underbody. – Despite a bit of a checkered history and without period competition this is still a most desirable Ferrari with its wide stance, big brakes and original alloy body. Realistically estimated by Bonhams, it is hard to understand why a deal wasn’t done at the reported high bid. Lot # 160 1966 Ferrari 275 GTB Longnose Alloy Coupe, Body by Pininfarina/Scaglietti; S/N 08143; Engine # 08143; Argento/Black; Estimate $3,300,000 – $3,600,000; Cosmetic restoration, 3+ condition; Not sold at Hammer bid of $3,200,000 – Chrome spoke Borrani wire wheels, blackwall tires. – Underbody painted over old, peeling undercoat. Sound paint and interior. – Offered at Mecum Monterey in 2012 in similarly mediocre condition where it showed about 1,000 fewer kilometers on the odometer. It was a no-sale there with a reported high bid of $1.1 million. Now tripled in value, at least in the consignor’s view, in just 2 1/2 years, the reported high bid here should have been more than enough to see it on its way to a new home. 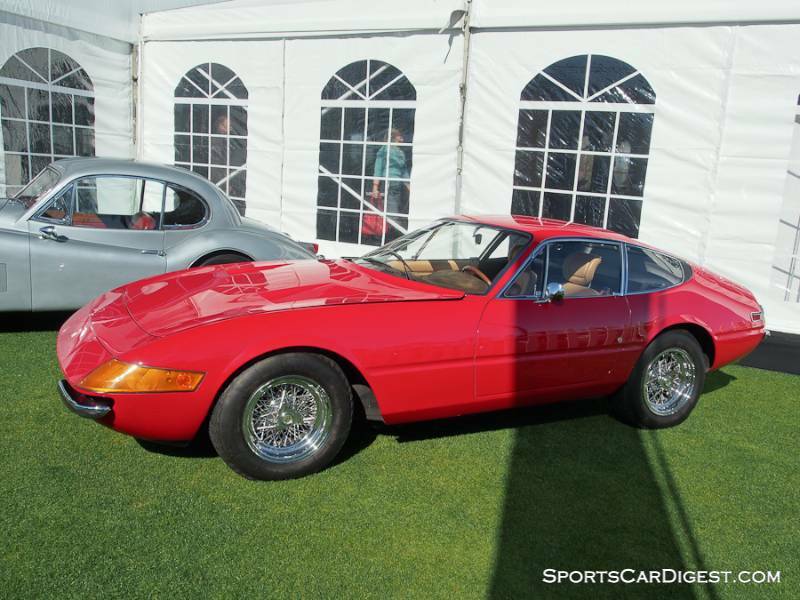 Lot # 171 1971 Ferrari 365 GTB/4 Daytona Coupe, Body by Pininfarina/Scaglietti; S/N 14045; Engine # B820; Red/Beige leather; Estimate $700,000 – $850,000; Visually maintained, largely original, 3- condition; Not sold at Hammer bid of $650,000 – Chrome spoke Borranis, Michelin XWX tires, A/C, cassette stereo, pop up lights, painted nose panel. – Sound repaint over old paint, decent chrome and lightly used replaced interior. Ugly underbody with layers of undercoat. Orderly engine but dropped into surroundings casually resprayed assembled. Decent mousefur dashtop. Disappointing. – It is unduly optimistic to expect this sound, never restored, Daytona to bring more than the reported high bid here. 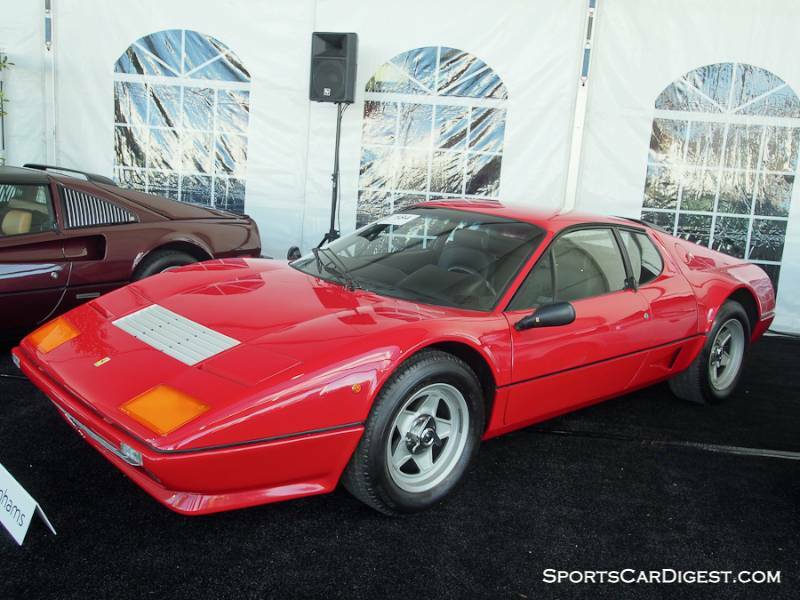 Lot # 184 1982 Ferrari 512 BBi Coupe, Body by Scaglietti; S/N ZFFJA09B000040999; Engine # 110A00118; Rosso Corsa/Black leather, cloth inserts; Estimate $140,000 – $180,000; Visually maintained, largely original, 2- condition; Hammered Sold at $325,000 plus commission of 10.00%; Final Price $357,500 – 5-spoke Cromodora centerlock alloy wheels, TRX tires, A/C, Pioneer cassette stereo, tools, manuals. – Good repaint with minor scrapes and chips and lightly worn interior. Clean, orderly engine and underbody. Federalized by Amerispec. Odometer shows 8,554 believable miles but unused for two decades and in need of thorough recommissioning. – Bonhams’ estimate took into account the long dormant condition of this BBi, but not the allure of its originality at a time when these 5-liter supercars are finally being recognized as the exceptional automobiles they are. Even at that, however, this is a breathtaking price that moves the BB needle nearly off-scale when taken into account with the other two 512 BBs sold in Scottsdale, both at values over $300K, and the pair of 365 BBs for even more. 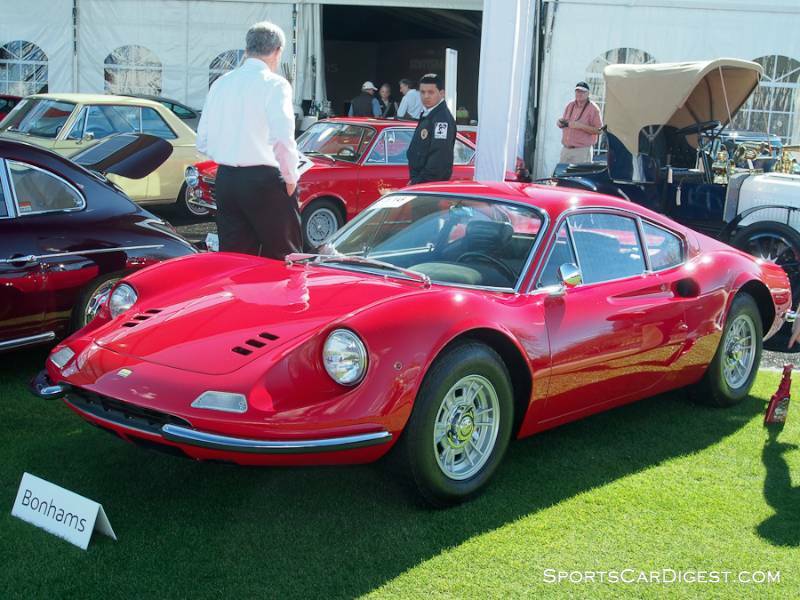 To add to the 2015 Ferrari madness, two Chevy powered 250s, a PF Coupe 1175GT; and a GTE 4777GT, sold for $225,000 and $234,000 respectively. The PF Coupe was very nice, the GTE was not.